At its core, the eBBM Suite includes the original BBM’s features and capabilities including Channels, screen sharing and video calls. Mobile messaging has emerged as one of the significant revenue streams in the move to moile computing, a recent development – Facebook’s acquisition of WhatsApp – is a good indicator of this trend. 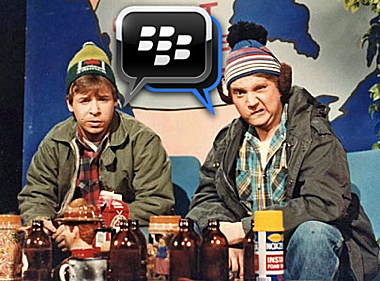 Witness BlackBerry’s extension of its BBM app to other mobile platforms namely Android, iOS and Windows Mobile, currently stands at 80 million downloads. The release of eBBM should cement BlackBerry’s position as the choice provider of mobile solution in the enterprise. Now I’d like to introduce the eBBM Suite. This new family of products and services has features and capabilities tailored to meet the needs of our enterprise customers and still address the needs of the broad end user. BBM Protected is the first solution we will offer as part of the eBBM Suite and is expected to launch this summer. The first solution to be offered from the eBBM suite is BBM Protected created to establish trust through end-to-end encryption of messages. BBM Protected uses AES-256 symmetric encryption keys for messages, other features offered are public-private signing and encryption key pairs. BBM Protected will work across BlackBerry 10 and BlackBerry OS smartphones in regulated mode with no OS upgrades required.